Local Council Membership: You may join the Northern California Planned Giving Council (“local only”). This dues option is available for $95 for 12 months. Local only membership includes discounts on all programs and the annual conference. To join the Council, either in conjunction with CGP or the local Northern California council only, visit charitablegiftplanners.org/join. National Plus Local Council Membership: You may join BOTH the local council (NCPGC) AND the National Association of Charitable Gift Planners (CGP) (formerly the Partnership for Philanthropic Planning/PPP). To join the Council, either in conjunction with CGP or the local Northern California council only, please visit the website using the “Join” button. The Council also encourages participation on committees including government and community relations. 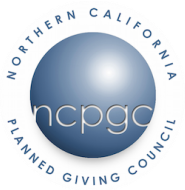 ﻿We look forward to having you participate as a member of the Northern California Planned Giving Council.